Take the Catamaran to popular events on Lake Constance: The Lake Constance Catamaran Company and Messe Friedrichshafen offer discounted Combi-Tickets to many of the major exhibitions and trade fairs. 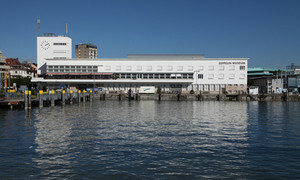 Visitors from Constance and Switzerland travel quickly and economically to events in Friedrichshafen. Travel on the „Constanze“, „Fridolin“ and „Ferdinand“ makes the journey an enjoyable adventure. And one further important advantage: the Combi-Ticket serves as your admission ticket and saves you valuable time. There is no need to wait in line to purchase separate admission tickets! Combi-Tickets can be purchased at the time of exhibitions and trade fairs at the Catamaran Service Center and at catamaran ticket machines located in Constance. Discover our new exhibition 2014 "Turtle Shelter!" The Zeppelin Museum Friedrichshafen is unique in Germany. It houses the world’s largest collection on aviation. The collection on the history and technology of aviation is displayed on 2,300 square metres of exhibition floors. A wealth of original items, models and photographs give visitors information about the fascinating flying airships. 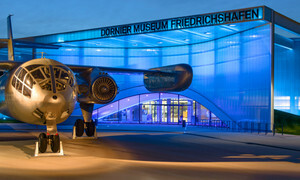 Anyone can be a pioneer – that's certainly one message visitors to the Dornier Museum Friedrichshafen will take home with them. Around 400 exhibits, including twelve original aircraft, seven full-scale models from the world of aerospace, and a life-size replica of a Dornier Merkur plane from the 1920s, allow technology and history buffs and aviation aficionados of all ages to experience 100 years of exciting aviation history – an inspiring celebration of the pioneer spirit. The catamaran from Constance is a fast, inexpensive way to reach the Dornier Museum. The Cat Combination Ticket includes the price of the trip from Constance to Friedrichshafen Airport and back by catamaran and train, plus admission to the museum. Tickets can be purchased at ticket machines located in the catamaran waiting area at port Constance and at the BSB Service Center located in the harbor area.